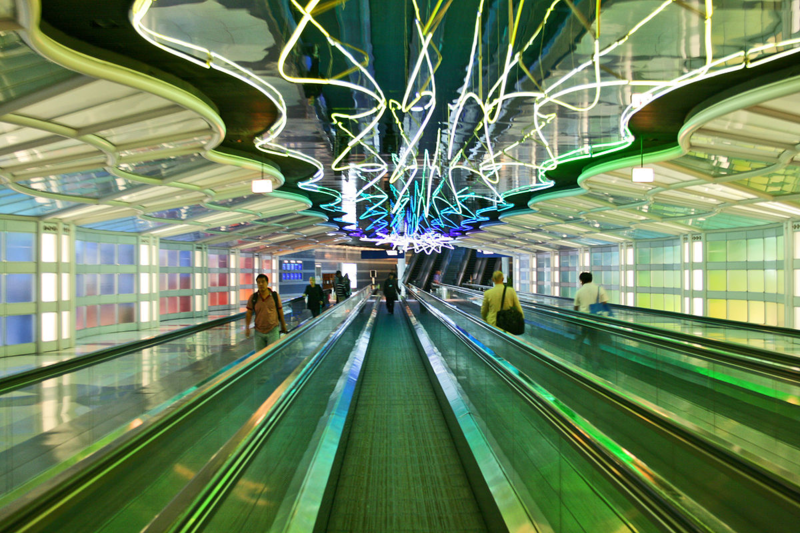 Even for experienced travelers, O’Hare is a spectacle that never fails to impress us at InMotion. From the sheer size of the crowd to the awe-inspiring displays of public art, it’s impressive that such an intricate piece of public infrastructure continues to service millions of travellers every year. As one of the busiest airports in the world, O’Hare is dedicated to providing an exemplary experience no matter how long you stay. O’Hare is home to some of the most spectacular art that has ever graced an airports walls, and it ranges from the subtle to the truly massive. “Jet Trails” by Guy Kemper is a surreally beautiful piece of hand-blown glass suspended from the windows in Terminal 1. 50 feet long and 12 feet high, it’s large size is nothing compared to the four-story model of a Brachiosaurus skeleton in Concourse B of Terminal 1. If you’re looking for more personal pieces of art to spend time with, you can head to the Treasury of Petra piece in Terminal 5 with a pair of Aftershokz Trekz Air Open Ear Wireless Headphones. They use bone conduction technology to deliver your music directly into your ears while you can still listen to the ambient noises around you. This impressive technology is perfect for working out and staying alert, but it can also service you in quiet moments when you’re absorbed in the beauty of a piece of art but still need to listen to the intercom. Founded in 1898 by an immigrant of German descent, Herman Berghoff, the Berghoff Cafe has been serving Chicago for over a century. You can taste a delicious craft beer, or a specialty Berghoff beer, in their cafe in Terminal 1, Concourse C. For drinks that are more stimulating, you can choose between a variety of coffee and espresso beverages for your ideal pick-me-up between flights. If you have more time, and need something more substantial, you can sit down at their restaurant and pore over their extensive menu. From breakfast omelettes and sandwiches to paninis, pizzas, and cold wraps, their selection offers something for all palates. A local favorite is one of their famous hot carved sandwiches. Featuring delectable meats and cheeses, and served on bread that’s baked daily in their store, they’re the perfect pre-flight meal. While you eat, don’t forget to charge your phone on a UnPlugged 10K Rechargeable 10,000mAh Wireless Portable Charger. 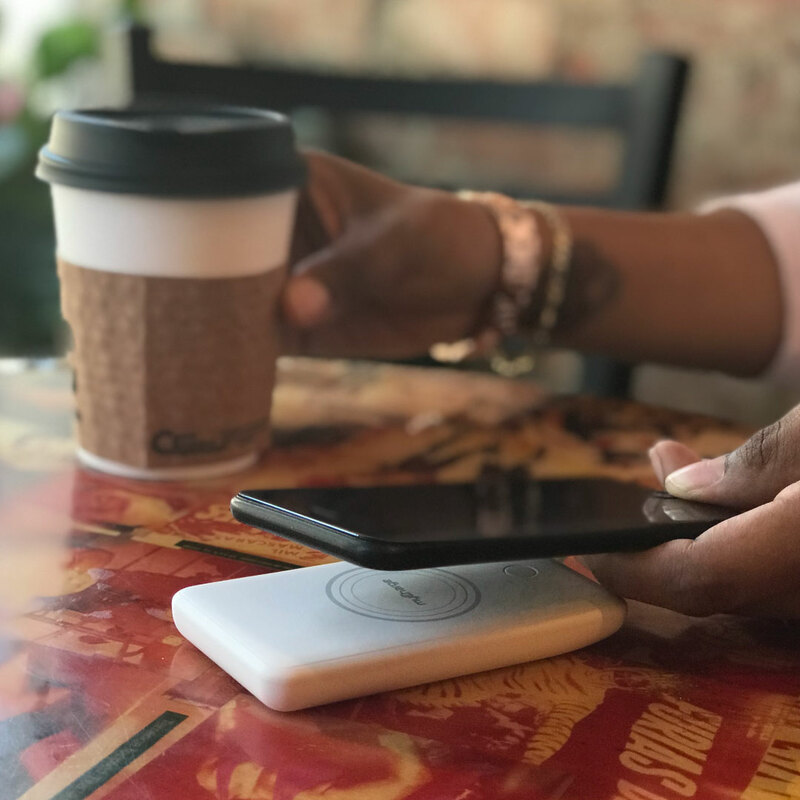 With this Qi-enabled portable and wireless charger you can charge your phone and use the two built in USB-A ports to charge your headphones at the same time without the need for an outlet. Chicago is home to some of the United States’ most iconic museums: the Museum of Science and Industry, the Adler Planetarium, the Chicago Art Institute, and more. Deserving its place among these titans of American institutions is the Field Museum of Natural History, one of the largest museums of natural history in the world. 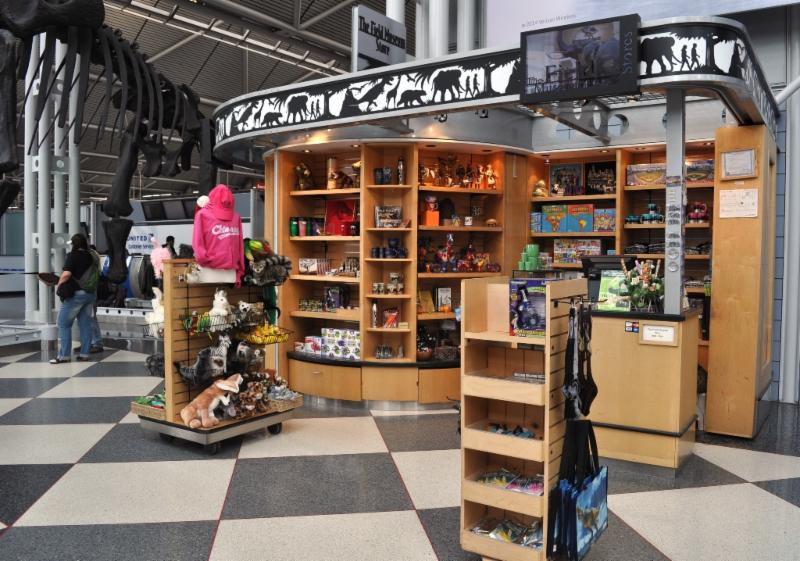 If you are flying through O’Hare, you can purchase a little piece of the magic at their store, located under the Brachiosaurus skeleton in Terminal 3, Concourse K. Check out the large selection of exciting toys for your little ones at home, or a piece of art made by artisans from another country. Once you have the mementos that you’ll remember this trip through, you can step into our InMotion locations to find the products that’ll make your trip even smoother. 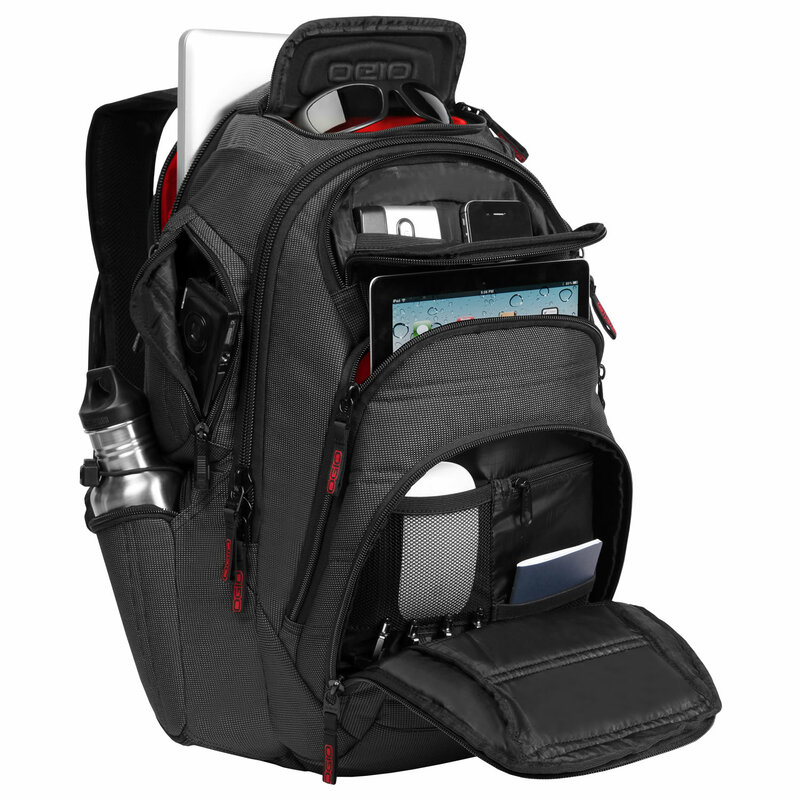 To help you carry all your artifacts from the Field Store, you can pick up an Ogio Renegade RSS Laptop Backpack. With its armored laptop sleeve and shock-absorbing shoulder pads, you’ll be able to carry all your valuables in ease and comfort. 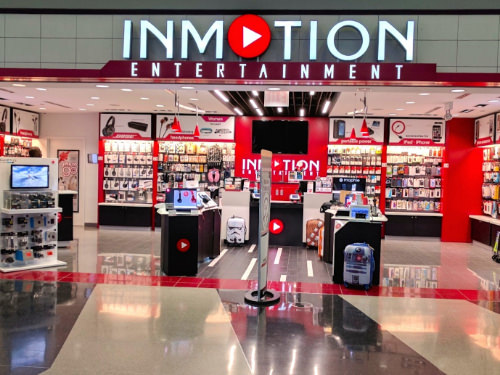 If you are looking for an electronics store in Chicago’s O’Hare Airport, you won’t have to look far to find an InMotion store. With locations in Terminal 1, Next to Gate B7; Terminal 2, Main Hall, Near Gate E1A; & in Terminal 3 (2 stores), Across from Gate H1 and across from Gate K12, you are only steps away from fulfilling all of your tech needs. From Bose Headphones, to official Apple products or even a T-Mobile Tourist Sim Card, InMotion has everything you need for your next trip. O’Hare is an airport that ensures a comfortable and elegant travelling experience. It’s one of InMotion’s absolute favorite airports, and it never fails to take our breath away. What’s your favorite aspect of O’Hare? Do you have any fond memories of times spent in the airport? Let us know in the comments!